How will the surly, combat-hungry Dinobot wield the power of the Primes? That useless bit of marketing shatter is all that's printed on the back of the packlaging - the more useful bio text we've given you for the other Dinobots came from a page on Hasbro's website, but that page omits Snarl, so we'll just have to tell you about him ourselves. He hates the altmode he was given, he resents being stuck on Earth fighting a war instead of being home on Cybertron, and because he doesn't talk much, no one spends any time with him. Being on a battlefield makes him forget all these problems, though, so he's even more combative than the rest of his team. Weird, then, that the robot's head is the most delicate of all the Dinobots. Okay, maybe he's tied with Slash, but definitely smaller and softer than the blocks all the other G1 dinos are carrying around on their shoulders. His silver face is sculpted with a frown, and his black helmet has a pair of blunt horns rising up off the sides. Snarl has a torso even larger than Slug and Sludge had. It's all straight angles, no curves, making him look mighty. 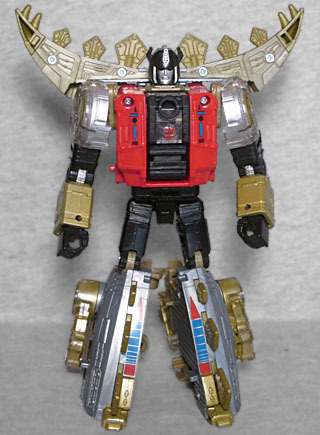 His shoulders are also nearly as big as Grimlock's, so even having narrow little legs can't make him look weak. 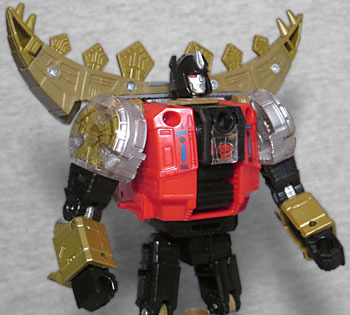 Of course, being covered in spikes helps, too - like the original Snarl, he's got massive yoke of sharp things riding his shoulders and doubling his overall width. The figure moves at the neck, shoulders, biceps, elbows, waist, hips, thighs, and knees. Like his fellows, his colorscheme is red, silver, black and gold. Several of the parts are molded from clear plastic and then painted on the insides to give them a layered look, which is both true to the old toy and better than it, because here it's just paint and not chrome. His details are tampographed on, not stickers. He's armed with a clear sword and the new hand/foot/gun for Power of the Primes. That thing can either be held like a gun, plugged into Snarl's chest like a reverse backpack [a frontpack --ed. ], or the little clear tab can be popped out of it and that that can be held as a gun. Or shield. Whichever. There's one weird little quirk to Snarl's conversion process: you have to open the panels on the backs of his legs to fold the legs over, then close the panels again - nothing difficult, just unusual for modern Deluxe Class figures. On the vintage toy, the robot's chest ended up on top of the dino, while here it's underneath. Way to change things up, design! 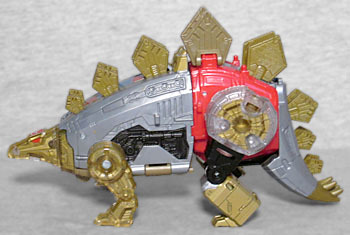 Snarl is, as he's always been, a stegosaurus. Once upon a time, when steggies were first being discovered, some people theorized that the plates on their plates on their back laid horizontal, like shingles, instead of standing upright - in fact, stegos in Greek means "roof." Of course, some people also thought the plates were used for flight, so clearly this was in the days when opium was cheap and plentiful. Of course, on this toy, to of the plates can hinge down, for no readily apparent reason. And because they opted to retain the robot shoulder-spikes, Snarl's dino mode is the old-fashioned "dragging tail" kind. It looks so weird! "Power of the Primes" is sort of a clearinghouse for the past few years' Transformers gimmicks - you've got the Prime Masters duplicating the "Titans Return" heads, and you've got gestalts like "Combiner Wars." Snarl was never part of a combiner before, but now he's the left leg of Volcanicus. Or turn him into the right arm, what do we care? The instructions include steps to do both. 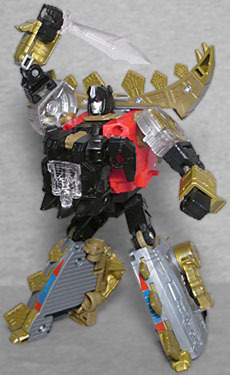 The peg on his hand/foot/gun is gold, rather than the black all the other Dinobots had; hopefully that imperfection won't bother you too much. 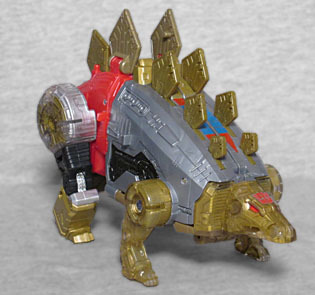 Snarl was not one of the Dinobots I had as a kid, but who doesn't love a stegosaurus? (At least, one that's not evil.) The dragging tail is a weird throwback, but the bot is good regardless.